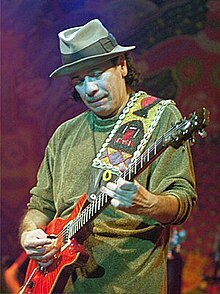 Carlos Santana audio (help·info) (born Julie 20, 1947) is a Mexican an American muisicker wha first acame famous in the late 1960s an early 1970s wi his baund, Santana, which pioneered a fusion o rock an Latin American muisic. ↑ "RCA's Peter Edge, Tom Corson on the Shuttering of Jive, J and Arista". Billboard. October 7, 2011. Retrieved 2011-12-31. This page wis last eeditit on 9 Julie 2016, at 05:47.